﻿ Chicago Hispanic Newspaper, Lawndale News, Hispanic Bilingual Newspapers, Su Noticiero Bilingue » Why the Grinch stole Christmas? April 26, 2019 7:24 am You are here:Home Local News Why the Grinch stole Christmas? Why the Grinch stole Christmas? Posted by Editor on November 20, 2014 in Local News | Comments Off on Why the Grinch stole Christmas? Max the Dog serves as the story’s narrator as the scheming Grinch plans to steal Christmas away from The Whos, the loveable characters that understand and embrace the true meaning of the holiday. When the Grinch realizes that he can’t take Christmas away from Who-ville by taking presents, he returns the gifts and decorations and joins the festivities, proving that all it takes is a little kindness and joy to make any Grinch not so mean after all. “Have a wonderful holiday season. 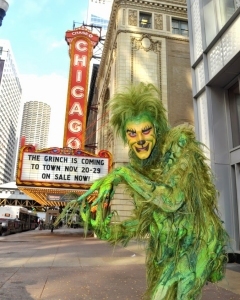 Love your family and come see me in the Chicago Theater,” said the Grinch to all of the Lawndale readers. “Dr. 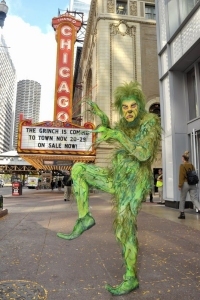 Seuss’ How The Grinch Stole Christmas!” features sets specially designed for The Chicago Theater with costumes inspired by Dr. Seuss’ illustrations. The 2014 production is directed by Matt August and choreographed by Bob Richard based on the original choreography by John DeLuca and originally created by three-time Tony Award® winning director Jack O’Brien. The ticket price ranges between $35 and $125. For more information, visit: www.thechicagotheatre.com.